Jeera or cumin (Cuminum Cyminum) seed is one of the most popular cooking ingredients. It has an indispensable spice with strong flavor and tepid aroma. If you need to leave a healthy lifestyle it is recommended to drink a galss of jeera water also known as Jal Jeera daily. All you need to do is boil a few seeds of jeera (cumin) in water, then allow it to cool and drink it early in the morning on an empty stomach. It helps to improve digestion and immunity and reducing water retention. Let’s see some of the amazing health benefits of Jeera water or Cumin water or Jal Jeera on these page. Jeera water can be considered a boon for people. In Ayurveda, we can find the lot of importance of jeera water for the human body and its direct connection to weight loss. Try drinking jeera water twice a day for a better and healthier body. Most of us suffer from daily ailments like constipation or bloating that adds to our body weight. 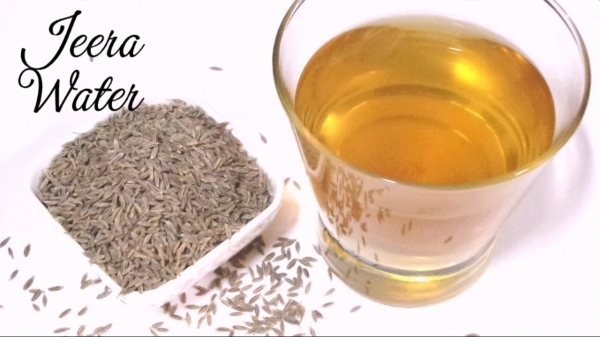 Jeera would help you cleanse the digestive tract and the colon. It has certain enzymes that trigger the generation of digestive juices, which help in digesting food. They supply the body with the important nutrients and vitamins strengthening it from within. This entire process in effect aids weight loss as the body’s defense mechanism becomes alert, and all the internal organs work at a faster and better pace than before. Cumin is very low in calories. There are only a mere 16 calories in two full teaspoons! This makes it a great way to amp up the flavor of your meals, without adding to your daily caloric intake too much. This in itself can make weight loss easier. Cumin can also speed up your metabolism, both due to its spiciness and because it has a lot of iron in it. Iron is vital to your metabolism, so adding more to your diet can actually help you burn more calories. And the more calories you burn, the more weight you lose. Additionally, the antioxidants and phytosterols in cumin can help lower your cholesterol and reduce blood sugar, and both of these can make weight loss easier and faster on the whole. Add a teaspoon of cumin seeds to a glass of water and bring it to a boil. Once the water turns brown, turn off the gas and cover the vessel. Allow the decoction to cool down to room temperature. Drink this tea three times a day to improve digestion and to help resolve minor stomach aches. If you want the tea to be a little mild, you can add some cumin seeds to a glass of boiling hot water and cover it. Let it steep and then decant the water. Drink a glass of jeera water every day to help you deal with the digestion problems. This is because jeera water not only stimulates the secretion of digestive enzymes but also speeds up the digestion process, thereby helping you fight indigestion. Moreover, as it clears out toxins from the body, drinking jeera water provides relief from stomach related problems like acidity, abdominal gas, morning sickness and nausea. Jeera water helps get rid of acidity and bloating, and provides relief from indigestion. It acts as a painkiller and is especially beneficial in curing stomach ache and abdominal pain. It is a very good anti-oxidant spice which fights with the free radicals in the body and enhances the body immunity to better fights with all the infections. If you are suffering from iron-deficiency anaemia, then including iron-rich jeera in your diet can help. Due to lack of iron, the blood supply to various parts of the body is hindered, which leads to fatigue. Because of its richness in the iron content, it helps in treating the anemia by maintaining the haemoglobin content of the blood. Jeera water is good for patients suffering from diabetes. You can drink it on an empty stomach to reduce blood sugar levels. If you have a sluggish metabolic rate, drink jeera water. It improves your energy levels and makes you feel so much better. Jeera water flushes out toxins from the body and facilitates the production of bile. Hence, it is extremely beneficial for the liver. Jeera water is highly beneficial for your liver and stomach. The antioxidants present in the seeds can flush out the toxic materials from your body and promote the regular activities of various internal organs.